Last I checked, this anime was available on DVD at The Right Stuf and Amazon. 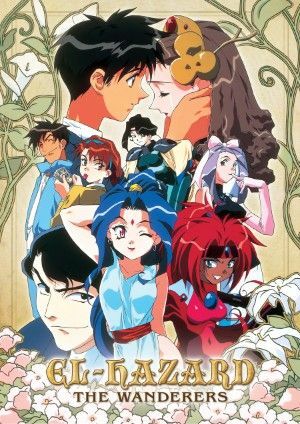 El-Hazard: The Wanderers is an alternate version of the story told in the original seven episode OVA series, El-Hazard: The Magnificent World . There are many similarities between the two, but The Wanderers , being a 26 episode television series, is able to delve much deeper into the mystical fantasy world of El-Hazard. Of course, later on another television series was produced called El-Hazard: The Alternative World, and that was a sequel to the original OVA series rather than expanding on The Wanderers . The story starts in an average Japanese high school where we soon meet our four main characters, Katsuhiko Jinnai, Makoto Mizuhara, Nanami Jinnai, and Mr. Fujisawa. My favorite is Nanami, because even though she's still a high school student, she is a no-nonsense independent business woman who's always on the lookout for ways to make a few bucks and get ahead in life. She is good friends with fellow student, Makoto, who is a reserved, kind-hearted 17-year old science geek that, unbeknownst to him, has a lifelong rivalry with Nanami's insane older brother and student body president, Katsuhiko Jinnai. Makoto often one-ups Katsuhiko without attempting to and without even realizing it, which unfortunately, this causes Katsuhiko to see Makoto as an adversary who is out to destroy him. And Makoto has no clue about this! The rivalry, combined with Katsuhiko's unstable mental health, leads to the pair struggling over a machine Makoto built, which is what ends up inadvertently causing our four main characters to be thrown into a strange fantasy world called El-Hazard. They all land smack dab in the middle of a forest, separated from each other, though Makoto and Mr. Fujisawa quickly run into each other. They soon realize that Fujisawa actually has super strength on this world when he saves a pretty young lady by decimating these giant humanoid bug-like creatures. And of course that lady turns out to be not just a lady, but a princess, the Princess Rune Venus of Rushtaria to be more precise. So while those two head back to the castle with the princess, Katsuhiko and Nanami each find their own paths. Katsuhiko hooks up with the queen of the bug-people that were after the princess, and he thoroughly impresses her with his remarkable ability for deception and evilness. He quickly becomes their ruler, implementing one fiendish scheme after another. Nanami, on the other hand, joins a group of travelers and uses her entrepreneurial spirit (along with some soy sauce seasoning which doesn't exist in El-Hazard) to go into business for herself. It's not long before Makoto and Mr. Fujisawa set out on an adventure in search of information that would allow them to go home again, and their guide on this journey is Alielle Relryle, a pretty young lady with purple hair and a diamond shaped mark on her forehead. The trio makes both friends and enemies along their trek, and they're shocked to find that their main enemy is none other than Katsuhiko. And later, they're all shocked to learn that Nanami is here in this world with them. So while Katsuhiko is happy staying in this world attempting to obtain ultimate power, the rest search for a way to get them all home. This is a fun anime to watch, with enjoyably quirky characters, action, adventure, comedy, and a bit of romance. The visuals aren't as clear and crisp as modern day anime, so it was made over 10 years ago, but that doesn't really matter as like many of the older, classic anime series, this one has a lot of personality to it. The new DVD release from The Right Stuf packs all 5 discs into a case the size of a standard DVD case, which is simply amazing. Those box sets can take up a lot of room on the shelf, even when they use the slimline cases, so I think all box sets should start going this route.